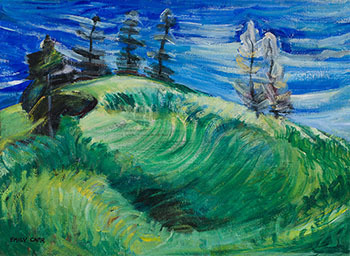 Emily Carr was acutely aware of her surroundings when on sketching trips – not just the appearance of the landscape details she was depicting, but the patterns of energy she sensed in nature. While camping in her van The Elephant at Albert Head, near Victoria, in 1935 she wrote, “This is a place of high skies, blue and deep and seldom cloudless…Everything is eternally on the quiver with wind. It runs on the short dry grass and sluices it as if the earth were a jelly.” In Spring Wave, Carr’s brush-strokes create a rolling, diagonal movement in the grass, while the sky swoops across horizontally. The small clusters of trees on the grassy hill rustle at different rates, reflecting the nature of wind, which shifts its intensity as it whirls through the landscape and encounters objects of varying resistance. The evergreen farther down the hill on the left seems to energetically swirl its foliage like skirts, while the three trees on the hilltop are a unified trio, bending to the right in harmony. Down the crest to the right, the two trees are paler, more delicate. Carr had a propensity to give the trees in her paintings personalities, as she revealed in her descriptions of her tree subjects in the book Hundreds and Thousands. Previously, Carr had immersed herself in the forest, but then became inspired to depict more open, airy landscapes. As she wrote, “Now I know that the sky is just as important as the earth and the sea in working out the thought.” Two locations were of particular interest in her new fascination with skies – the cliffs of Beacon Hill Park and Dallas Road near her home in Victoria, and the gravel pits of Metchosin, west of Victoria. Her “thought” was always on the manifestation of energy in her works, one great movement that swept through all the parts of her painting. Her use of oil on paper in the 1930s was highly conducive to the kind of sweeping, more transparent brush-strokes that captured that momentum. This strong and richly coloured canvas captures that same energy through a more densely painted approach. The blue of the sky pools in a deep cobalt in the upper left, then transforms to turquoise and streaks of bluish green clouds as it moves to the right. Her greens, too, move from a deeper hue in the hollow of the hill to gold and pale bleached highlights on the knolls. For Carr, the sky was a life-giving firmament and the earth a generative force that she felt a deep spiritual connection with. Every part of Spring Wave expresses Carr’s ecstatic vision of the power and splendour of nature on the West Coast. A previous collector of this work, Mrs. W.H. (Irene) Clarke, was the wife of William H. Clarke. William was co-founder of the publisher Clarke, Irwin & Company Limited, and Irene was active in editorial work. In 1940 Ira Dilworth (Carr’s friend and later, literary executor) met with William and Irene regarding Carr's writing. 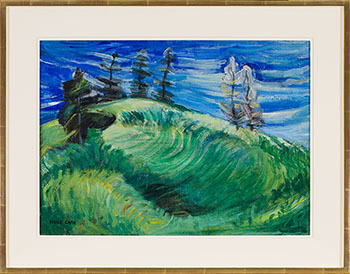 The couple were so enthusiastic about her stories that they undertook to publish Klee Wyck in 1941 and Hundreds and Thousands: The Journals of Emily Carr in 1966. The Clarkes became friends with Carr and exchanged many letters with her about their efforts on her behalf. They also visited her in her home, making plans for future publications. Subsequently they produced The Book of Small, The House of All Sorts, Growing Pains, Pause: A Sketchbook and The Heart of a Peacock. 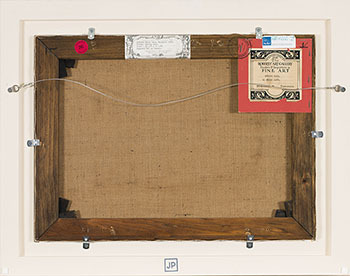 This work and lot 132 are from the Estate of Nancy Birks Hale. Nancy Birks was a Delta Gamma at McGill, obtained a Master of Education and served in the Canadian Red Cross in the Korean War. She had a colourful career that included teaching and working for the CBC. She arranged media interviews and book signings for top Canadian authors for the publishers McClelland & Stewart, and she served as director of public relations at the Montreal General Hospital. Her second husband John Hale, a graduate of Eton and Harvard, was chief financial officer at Alcan. Upon retirement, he was recruited by Pearson International to turn the family empire around, which he did successfully (at the time this included Royal Doulton china, the Financial Times and The Economist). Hale served on the boards of the Bank of Montreal and the Singer Corporation. These responsibilities resulted in Nancy and John traveling the world and entertaining on a grand scale. They cherished the collection of Canadian paintings, first edition books and important maps that they acquired.